In the last decade, there has been a resurgence in mainstream Hollywood of zombie projects. Notably, Dawn of the Dead, 28 Days Later (as a franchise), Resident Evil (as a franchise), I Am Legend, Quarantine, Shaun of the Dead, as well as the upcoming films Zombieland, World War Z, and Pride and Prejudice and Zombies. With this classic monster in mind, we wondered at The Science & Entertainment Exchange, where one can find teaching moments that could inspire science-based conversation on the undead. You’d be surprised, there’s a lot to learn from our brain-eating buddies. Recently, Harvard Professor of Psychiatry, Dr. Steven C. Schlozman drafted a fake medical journal article on Ataxic Neurodegenerative Satiety Deficiency Syndrome or ANSD. The piece was authored by five researchers, including three who worked on the piece posthumously and one “humanoid infected.” While the premise of walking dead was obviously conjured for the article, the remaining science was real. The essay inspired many zombie fans to read about neuroscience and think about the structure of the brain in a way they may not have otherwise. So there’s an example of fiction exciting people to learn facts about their own brains, but are there examples of real zombie-like creatures? Enter Canadian ethnobotanist Wade Davis, who made a pretty strong case for the pharmacological basis of zombification in his 1985 book, The Serpent and the Rainbow (which was later made into a film directed by Wes Craven). Davis also penned a more scholarly tome, Passage of Darkness: The Ethnobiology of the Haitian Zombie, in 1988. He discovered that Haitian voodoo priests relied on complex powders in their rituals. The ingredients differed according to region, but of seven of the eight samples he managed to collect contained pufferfish, a marine toad, a hyla tree frog, and human remains. The first two are the most pertinent, since both animals secrete powerful neurotoxins – chemicals that change the way neurons in the brain function, either by inhibiting the release of neurotransmitters or enhancing them to harmful levels. Interfere with this complex communication system, and you can interrupt speech, thought processes, motor function, even respiration. According to Davis, Tetrodoxin – a powerful neurotoxin – is a key ingredient in Haitian zombification rituals. The other crucial ingredient is a toxin produced by the sea toad (bufo Marinas) as a defense mechanism. A voodoo priest (boko) will poison a victim, causing him or her to become catatonic, and often mistaken for dead. Said victim is buried, the drug wears off after a few days, and the boko can exhume the “zombie” to make them a personal slave. Ah, but how to get the victim to do the boko’s bidding, like any good zombie should? Apparently, this is achieved via regular doses of datura stramonium (more commonly known as jimson weed), an extract of the thorn apple, which makes the victim docile and biddable. While the ritualistic practices Dr. Davis documented were further confirmed by British researchers in the 1990s, they didn’t find any examples of real zombies. Usually, people labeled as such were suffering from mental diseases, such as catatonic schizophrenia or an organic brain disorder. In other cases, it was as simple as mistaken identity. Perhaps human zombies are a tall order, however there does seem be a living example of zombification in Nature. Scientists at Ben-Gurion University of the Negev in Israel figured out how a certain species of wasp (the emerald cockroach wasp/jewel wasp, or Ampulex Compressa) managed to turn innocent cockroaches into willing “zombie slaves.” Lots of venomous creatures stun their victims before devouring them, but this particular species of wasp will sting its victim, so that the prey is able to walk, but can’t do so of its own accord. The predator-wasp literally grabs the roach’s antenna and leads it back to the wasp nest. There, instead of eating the roach, the wasp lays an egg on its belly. Eventually a larva hatches and devours the still-docile roach. 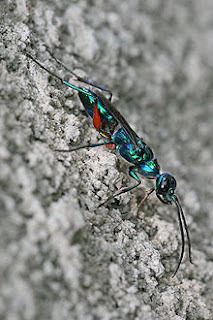 BGU researcher Frederic Liberstat and his colleagues knew the secret lay in “a rich cocktail of toxins” that the wasp injects into its victims. They theorized that the venom blocks a key chemical messenger in the brain called octopamine. This chemical is what makes insects alert, motivates them to move and perform physical tasks. It serves a similar purpose as noradrenaline, a chemical messenger involved in the “flight or fight” response. To test their hypothesis, they managed to replicate the effect by injecting cockroaches in the lab, and even figured out how to “un-zombify” the bugs by following up with an antidote injection. So, the next time someone tells you that zombies are the creation of overactive imaginations, remember the Ampulex Compressa and it’s pacified roach incubators. And, go ahead, settle in and enjoy a zombie flick now and again, it just might turn into valuable a learning experience.